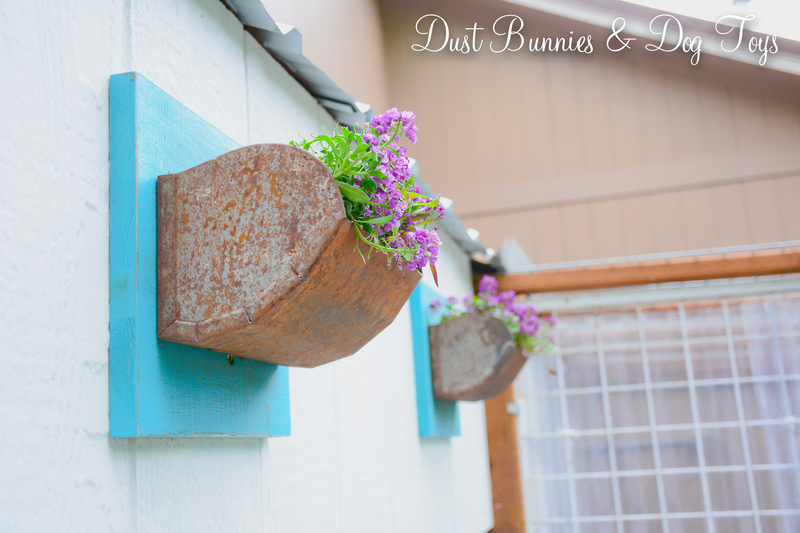 Today I’m sharing another couple of planters I mentioned in my recap post. 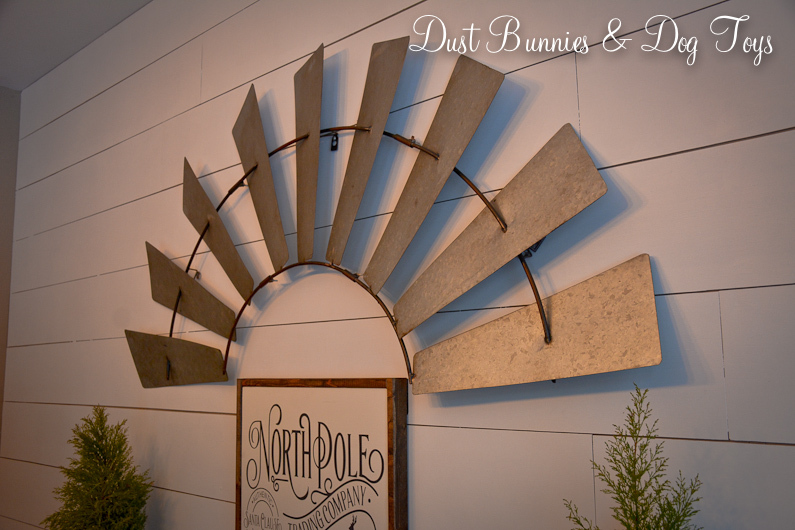 These cuties were made from old conveyor belt scoops that I got from Alaska Picker. The first I snagged at the AK Picker Day sale – right after finding the garage sale milk can. I hunted high and low for more of them but someone else had beat me to them. So when I spotted another at the Alaska Chicks Vintage sale I immediately claimed one. The first still had a section of conveyor belt attached, but the second was mounted to a piece of old barn wood. I wanted them both to match so I had the Hubs remove both the belt and board so I could mount them on new boards. 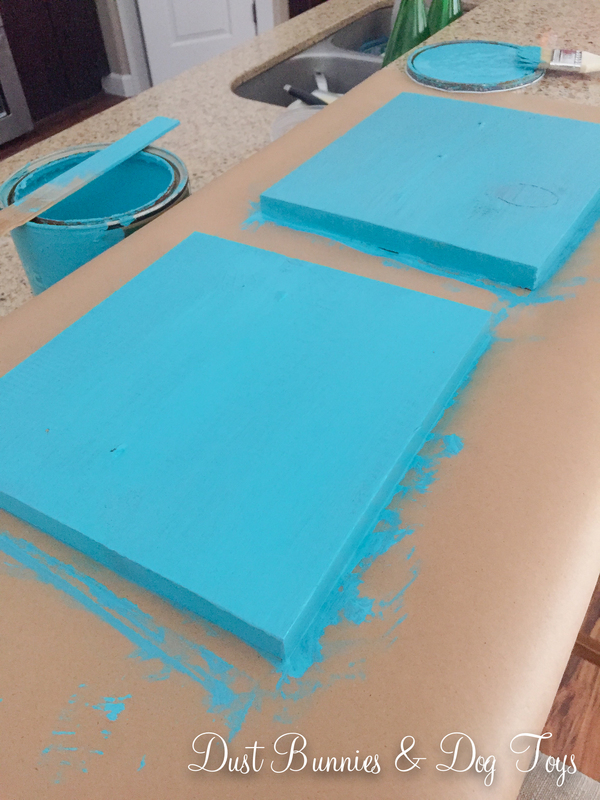 The Hubs cut me two pieces of wood from some scrap we had from another project and I dug out my outdoor teal paint to give them a couple coats. 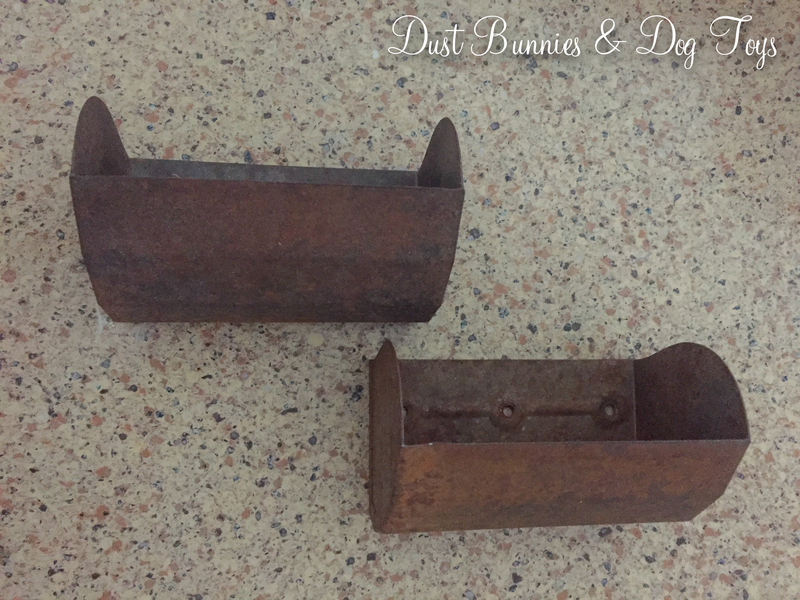 A little distressing around the edges gave them the perfect rustic look. The Hubs attached the bins to the new boards and I had this cuteness! I wasn’t sure where I was going to use them at first but when I came out and saw the big open area on the chicken coop expansion I knew they’d look great there. 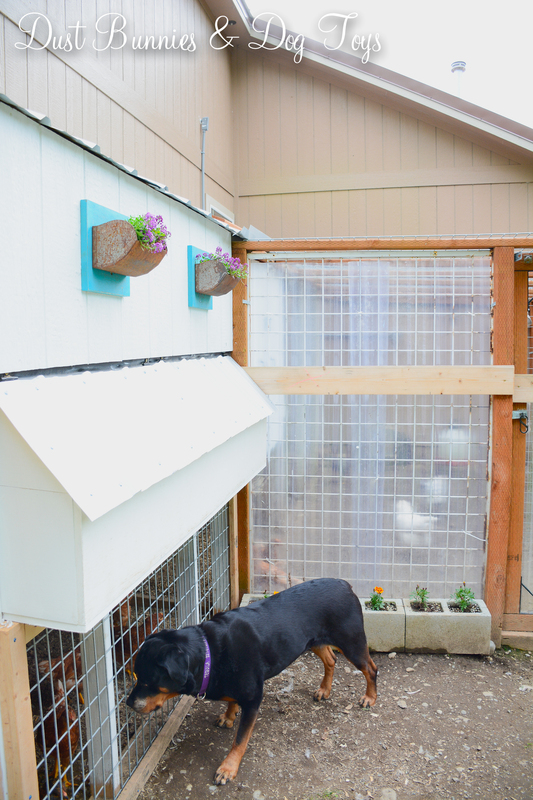 After I painted the coop the Hubs drilled some drainage holes in the bottom of the bins and put them up with a couple of screws. 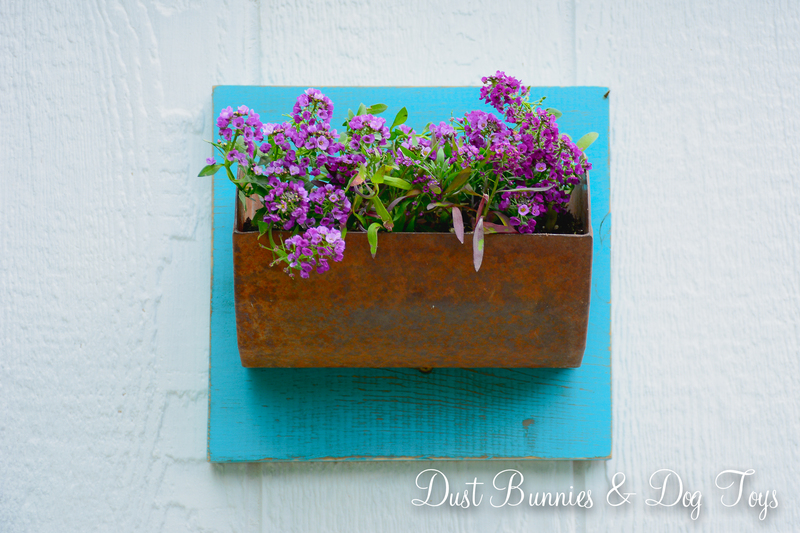 I filled them with purple alyssum to finish them off. I absolutely adore how they turned out. 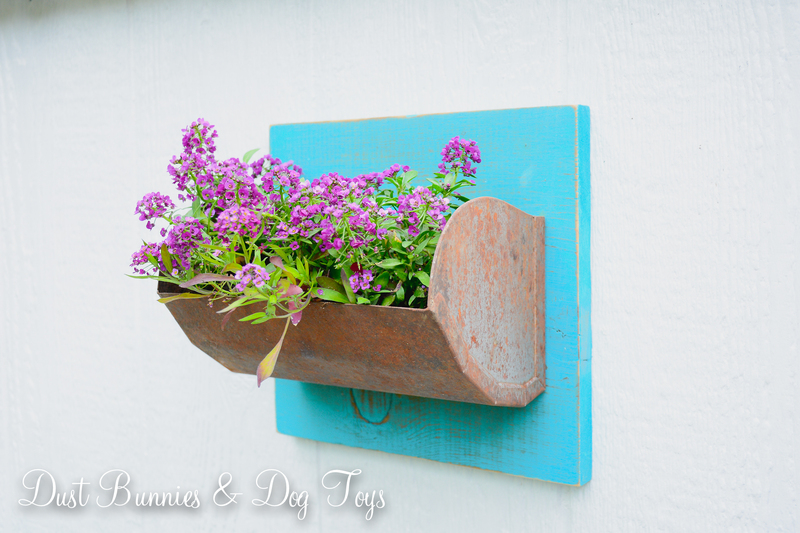 The combo of teal, rusty metal and purple flowers makes my heart do a happy dance. 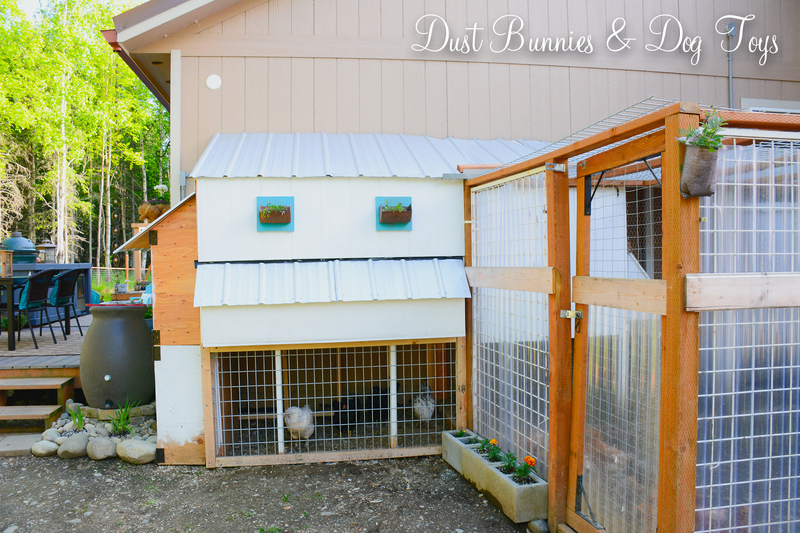 And it’s perfect for decorating a chicken coop – not to fussy but not to messy either. 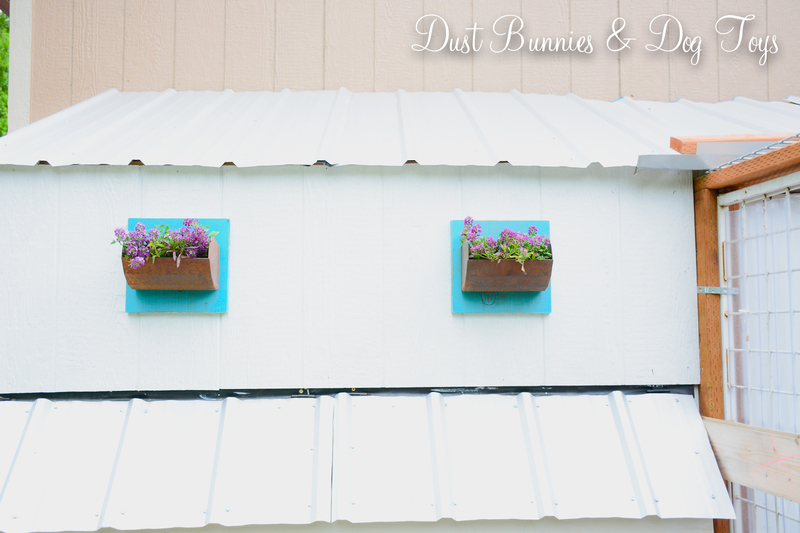 I still have a little painting to do on the lower part of coop and the Hubs plans to finish off the storage area door with siding to match the rest of the coop. I’ll share more about the expansion and new set up once it’s all done. We also plan to fill the area in front of the coop with pavers and pea gravel to finish everything off. Of course neither the chickens nor the dogs – or the cats for that matter – care about any of that. They just like having a window where they can see each other face to face. But this doggie/chicken/kitty momma is happy to have a pretty space for them all. 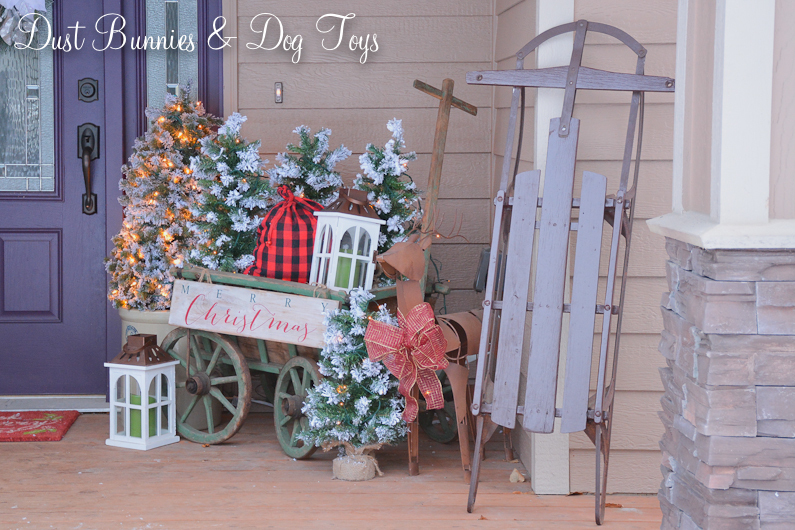 Merry Christmas on the Porch! 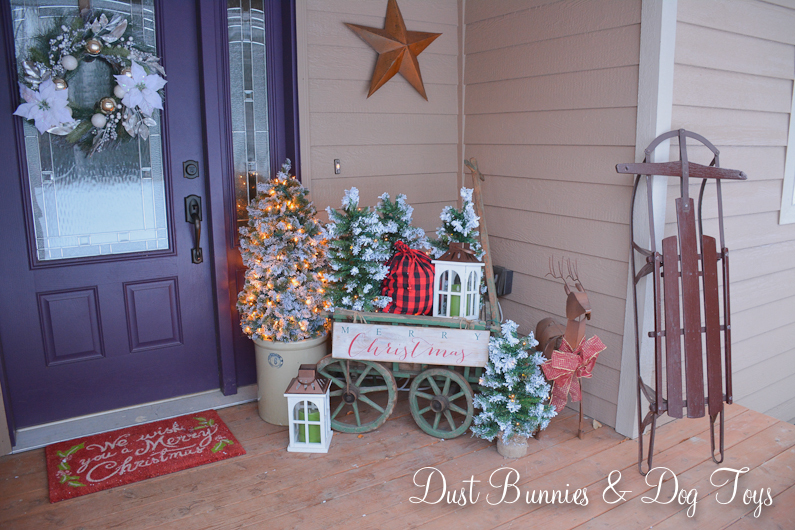 As promised in my last post, I’m sharing the festive decorations on our porch today! 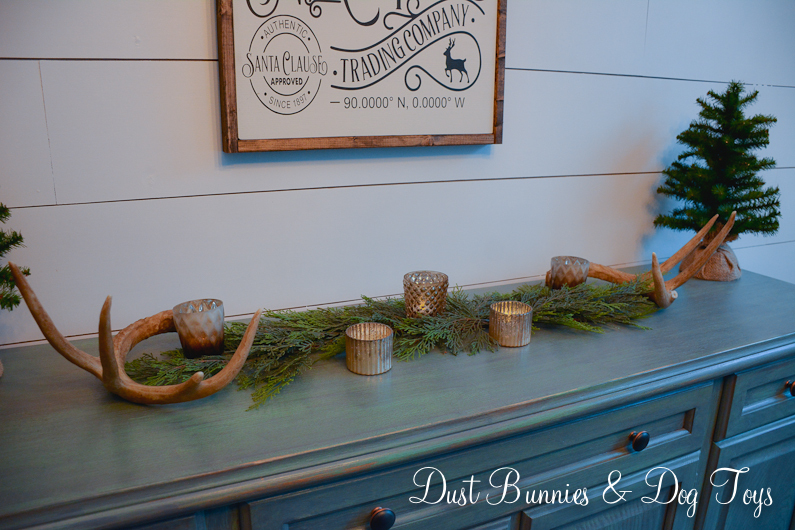 I’m really enjoying styling the little vintage cart we picked up at the junk show in Washington for each season. 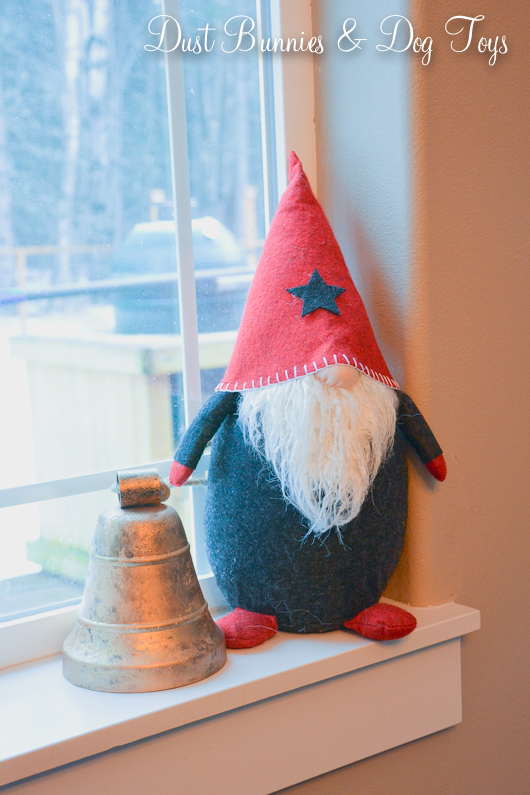 It’s just the right size for this little awkward corner on our porch and is the perfect start to each season’s look. Luckily it’s also well protected in this spot so I don’t have to worry about it too much. 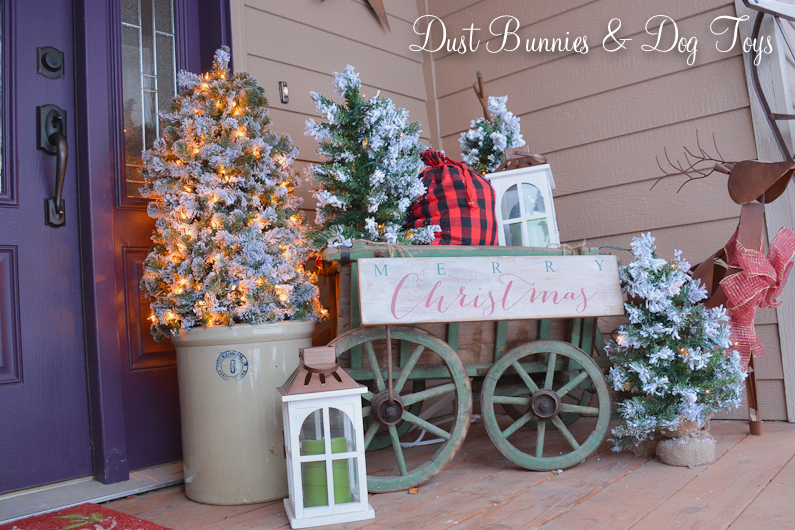 For Christmas, I continued our winter theme with frosty trees, white lanterns, a Christmas sign I picked up at the Alaska Chick’s Market, Rusty the reindeer and a larger tree that I DIY’ed to fit in the crock we picked up on the same trip we got the cart. I added the antique sled I’ve had for a while to the corner of the set-up. I may still add a bow or wreath to the sled, but if not it looks nice just as it is. It had that thick paint job when I found it, so I may strip it down to see what lies beneath one day. If you’re wondering how I made the tree in the crock, here’s a little behind-the-scenes. It’s a tomato cage wrapped in garlands and a strand of lights. 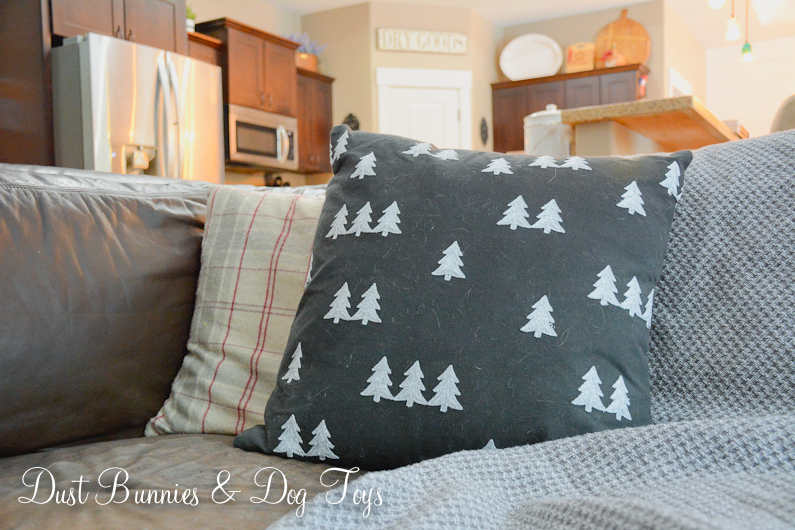 I didn’t do a step-by-step for this project since I’ve seen them all over the web and it was so simple that I did it while watching a movie with the Hubs! (Hence the crappy cell phone pics! But at least I got it done before Christmas!) Just tie the three stake feet at the bottom together to form the point of the top of the tree and start wrapping the garland from there toward the bottom – or what used to be the top when it was used as a tomato cage. 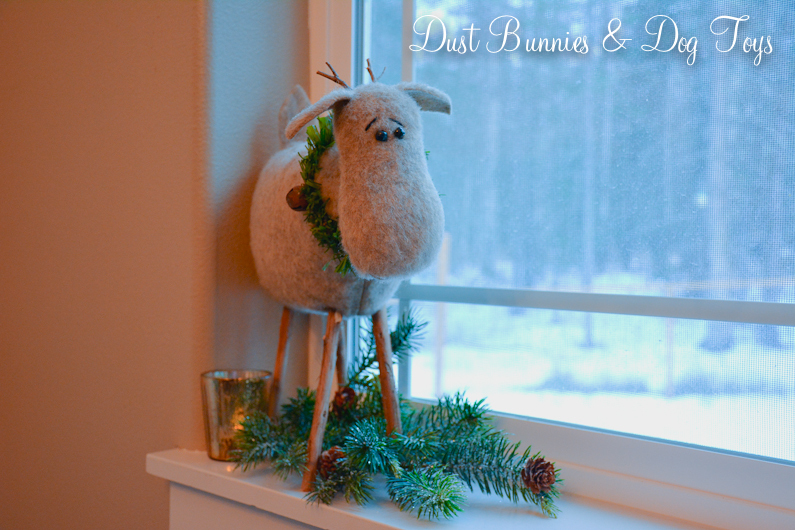 I can say having twine or wire handy to tie off the end and beginning of each garland so they stay in place, and to buy more garland than you think you’ll need. 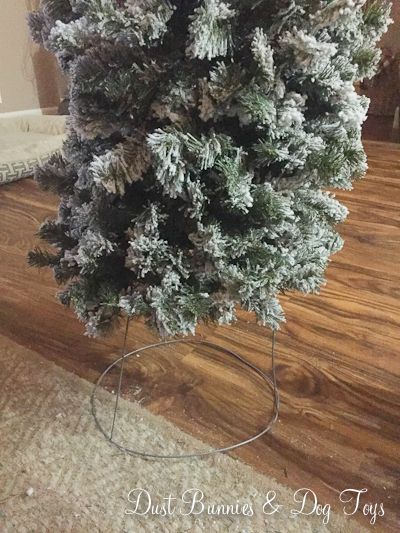 This one took four 12′ garlands and I still didn’t make it all the way to the bottom of the cage. I’m still tinkering with my Christmas decorations, but since the big day is just around the corner, I thought I’d share what I’ve done so far. I’ve migrated to a more “winter” look than full-on Christmas so things can stay up well into January without feeling out-dated. That’s handy since winter in Alaska can last well into the months that most classify as “spring”. I also find that my style is much more simple than it used to be, perhaps that’s an influence of our recent trip to Iceland where they have a very minimal Scandinavian look, or maybe it’s just a lack of time to create so much detail. 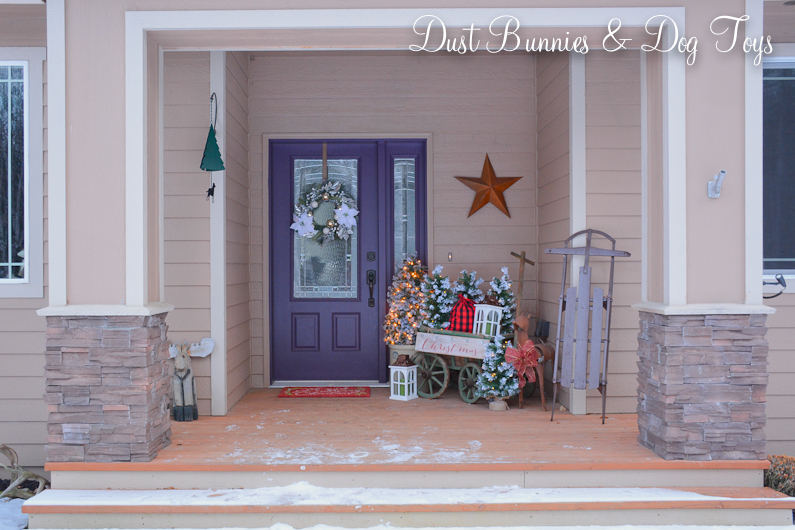 Things start out on the front porch, but I’ll share that in another post later this week. Today we’ll start in the entry way where Red and Flint are the first of my reindeer herd to welcome guests. Around the corner Gus hangs out above Brinley’s kennel where my cute storage bench used to be. It was a victim of her teething stage and so now the kennel lives in it’s place. Ahh the sacrifices we make for children…. 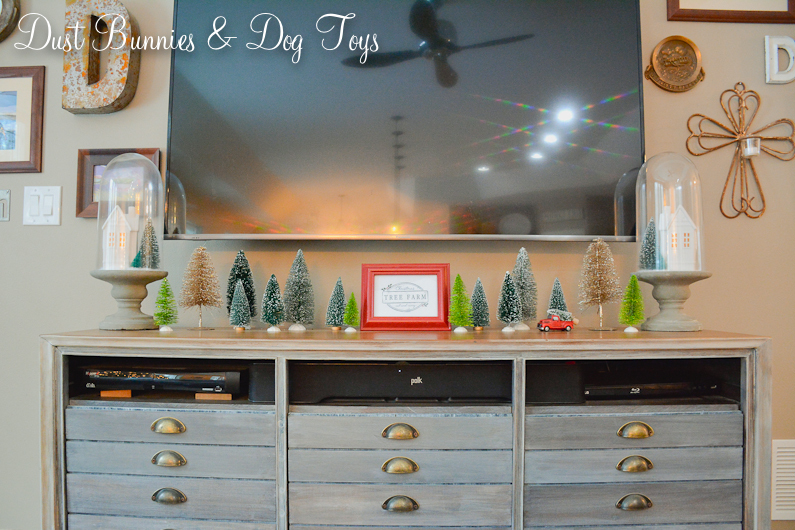 Just past the entry the media cabinet in the family room became a bottle brush Christmas tree farm just like last year. 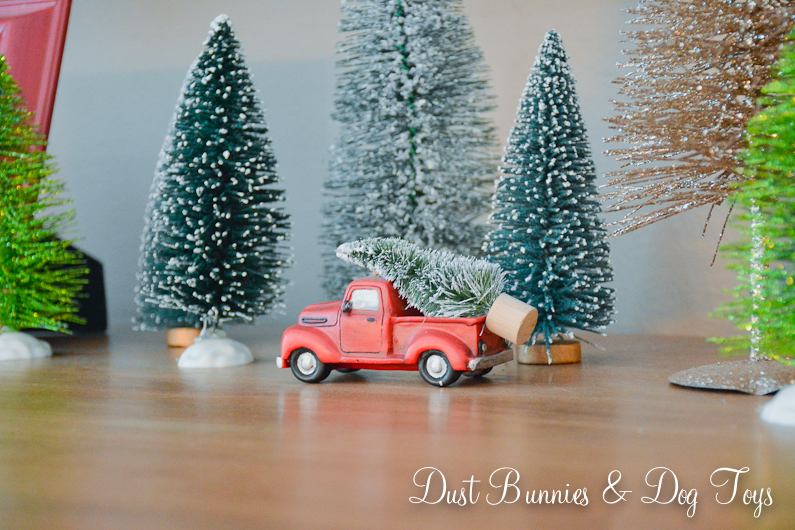 I’ve added the lighted houses in the pedestal cloches, a few more trees and this cute little red truck, which used to be an ornament. 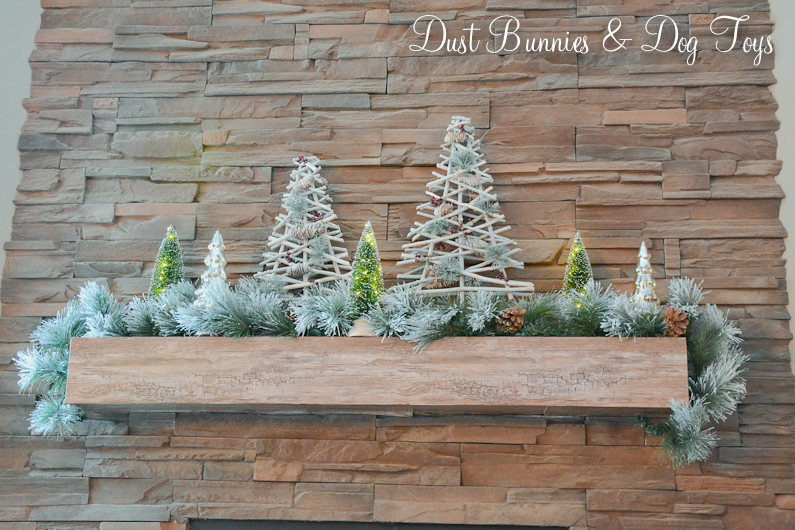 The mantel has a frosted garland and trees. 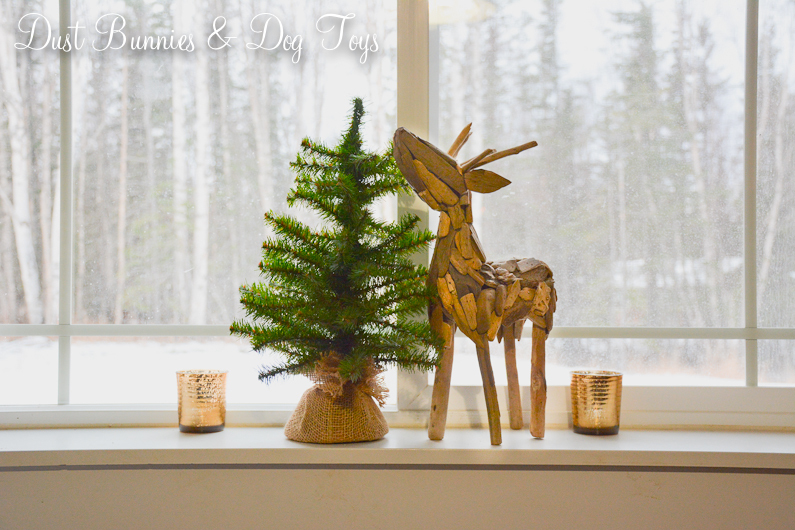 All of the trees except the two twig ones light up and create a pretty glow in the evenings – or pretty much most of the day since this is winter in Alaska! 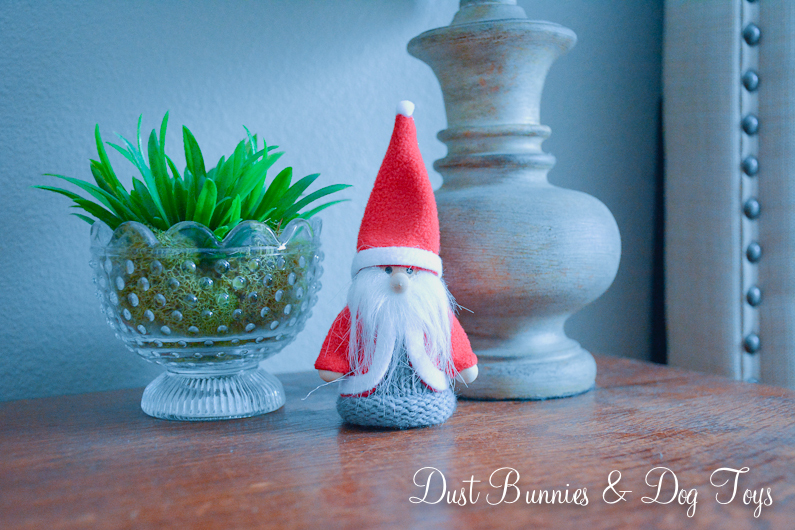 I found the light up bottle brush trees at Joann Fabrics this year and am very pleased with them, especially since I got them for a great price with a sale and a coupon! I’ll be watching to see if they have any in their after Christmas sales. 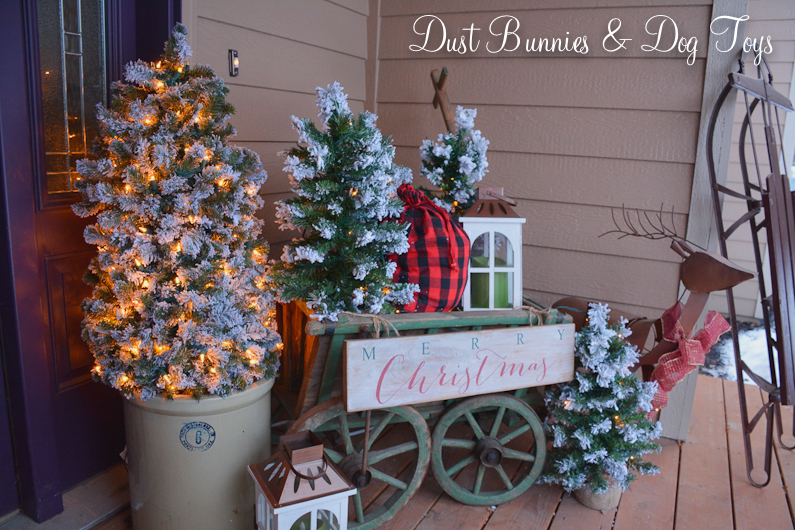 The two mercury glass trees came from a local vintage shop called Revive. I’d been hunting for some all over town and had pretty much given up when I found them tucked away in a display at a great price. If she’d had more I would have snatched them up too. They also had hollow centers and access through the trunk section so I crammed a strand of fairy lights into both to give them a soft glow as well. 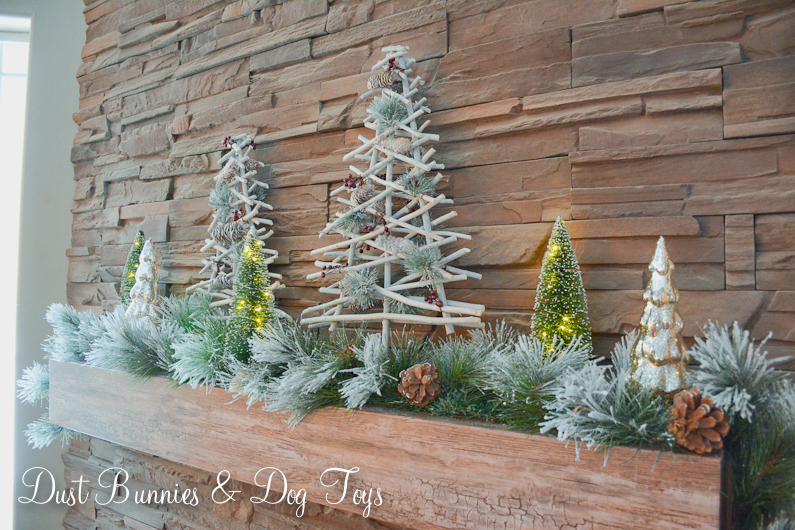 I may just add a strand of the same lights to the two twig trees so everything lights up! Next to the mantel Sebastian has a view out the window next to his own tree. Max moved out to the living room this year from the office where he’s been the past few years. Now he is one window over from Sebastian. 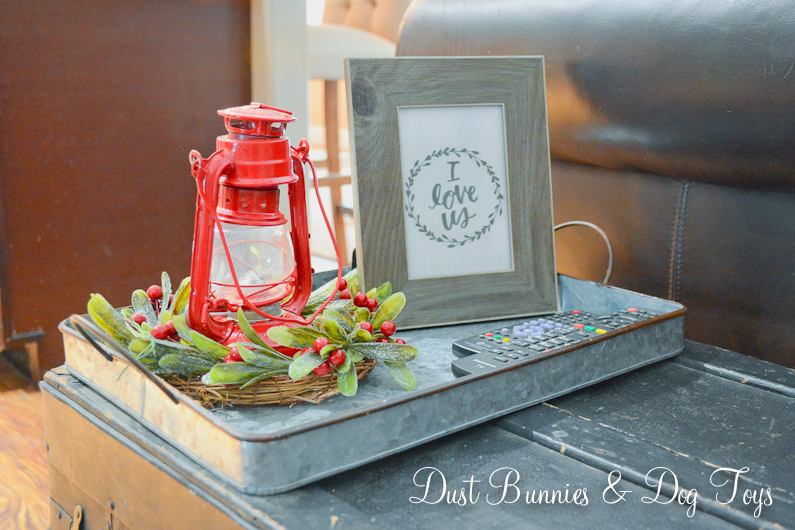 The side table next to the couch got a touch of color with this little wreath and lantern. I found the lantern at a garage sale earlier this year for just $2 and the wreath was another JoAnn’s sale find for around $5. I love how they look together. 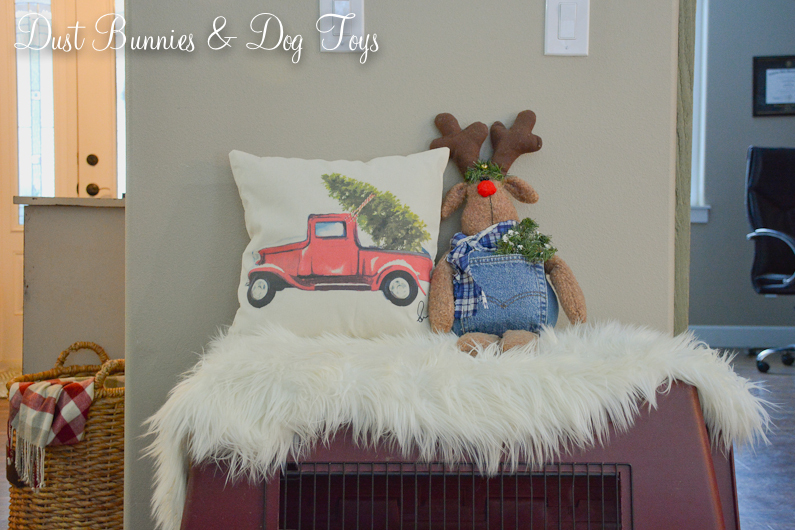 This is the only time of year I decorate with red, but I love the pop of color during the long winter months. 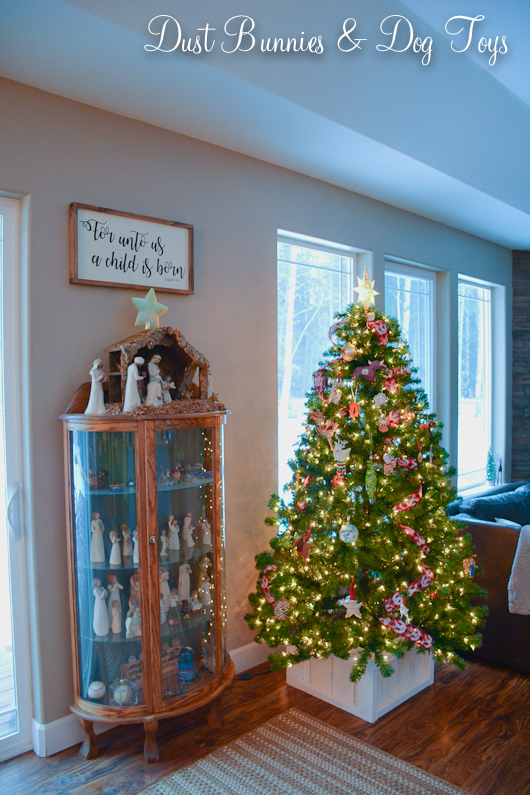 The tree is behind the couch, next to the nativity on the curio cabinet. When we first moved in 4 years ago I had a hard time figuring out where to put the tree, but this spot has worked out perfectly and become the tradition in our house. We have a new tree this year, after our tree of many years stopped lighting up in several sections last year. It’s an after Christmas clearance deal, so it’s nothing special but it will work for a few years until I can save up and somehow justify the cost of my dream tree along with the vintage style candles for it. The tree has a bit of Scottish flair after our trip this year. We picked up a couple of ornaments while there to continue the tradition of growing our collection. 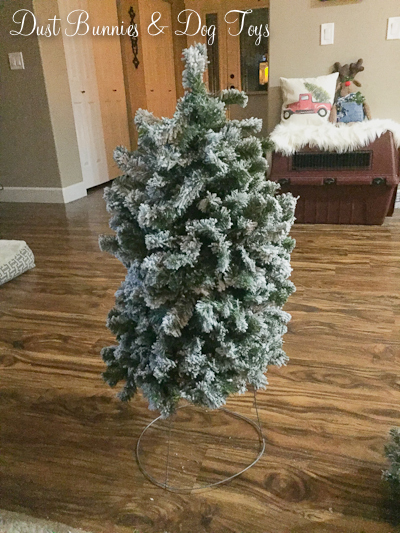 Unfortunately one of those new ones met an untimely fate when Luna and Brinley ganged up to attack the tree soon after it went up (repeat that phrase about things you do for your kids…). 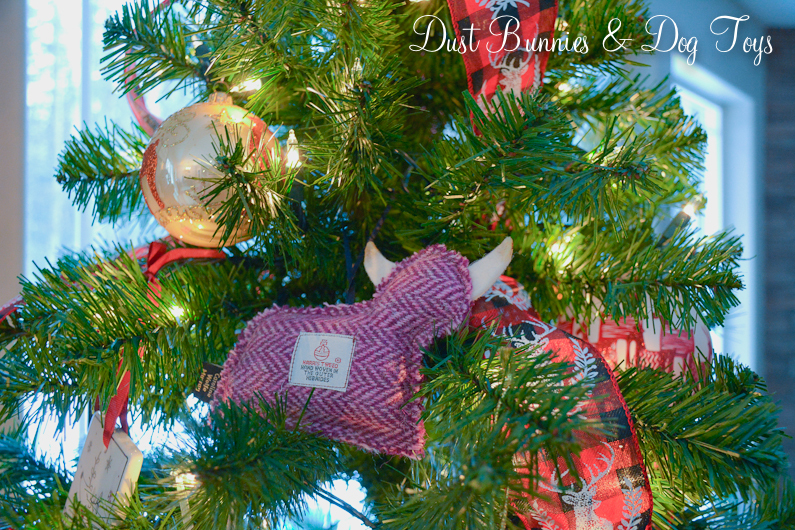 You’ll notice there’s less ornaments on the lower sections of the tree for that exact reason! 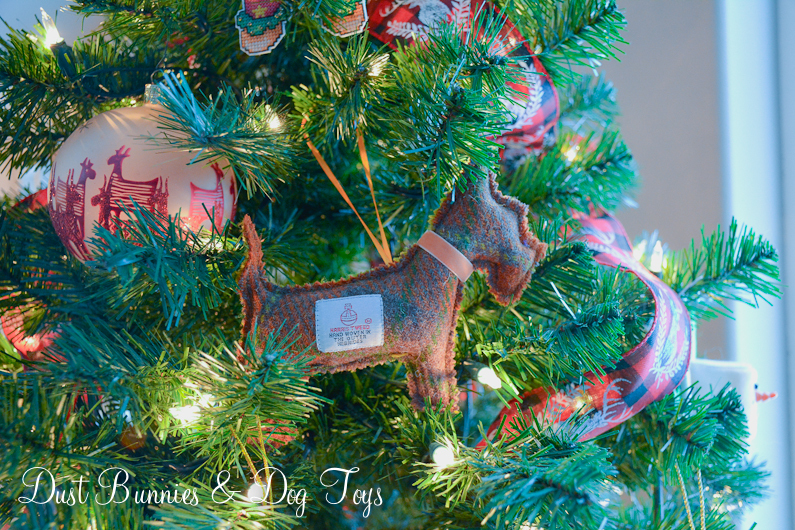 But our Harris Tweed highland cow and Scottie dog are still safe… for now anyways. 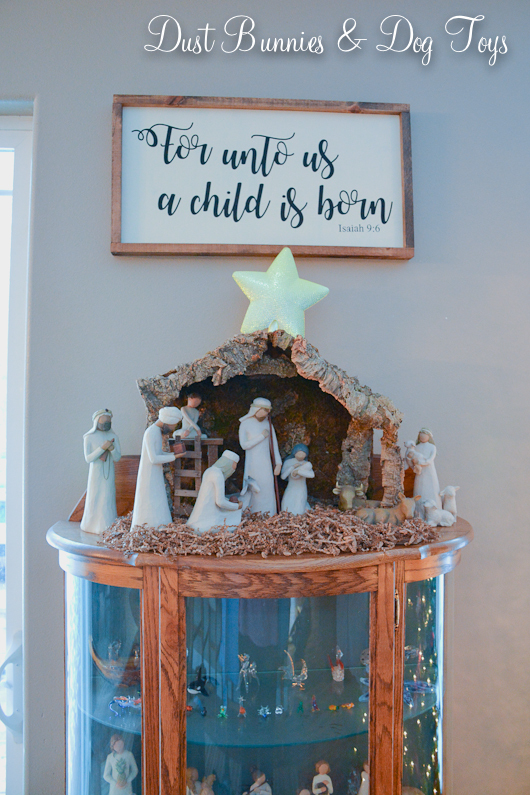 I had this sign for the nativity made last year after the holidays and really like it above the creche. 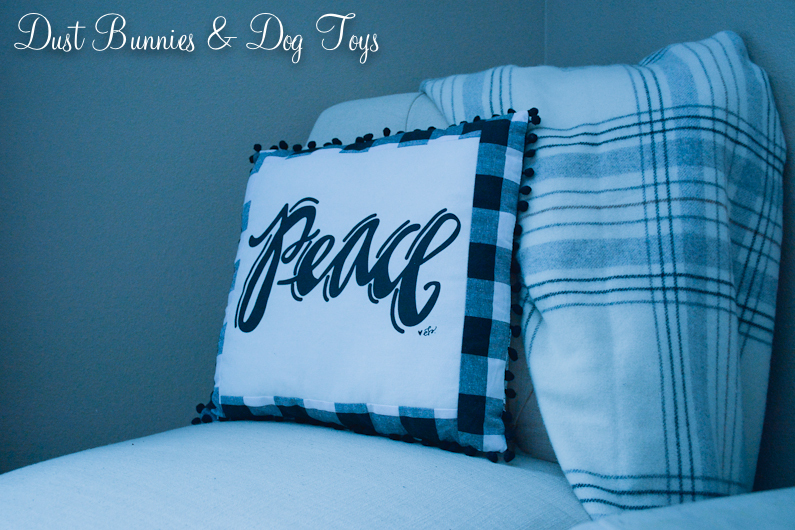 It’s the perfect compliment to the simple style of my beloved Willow Tree nativity set. 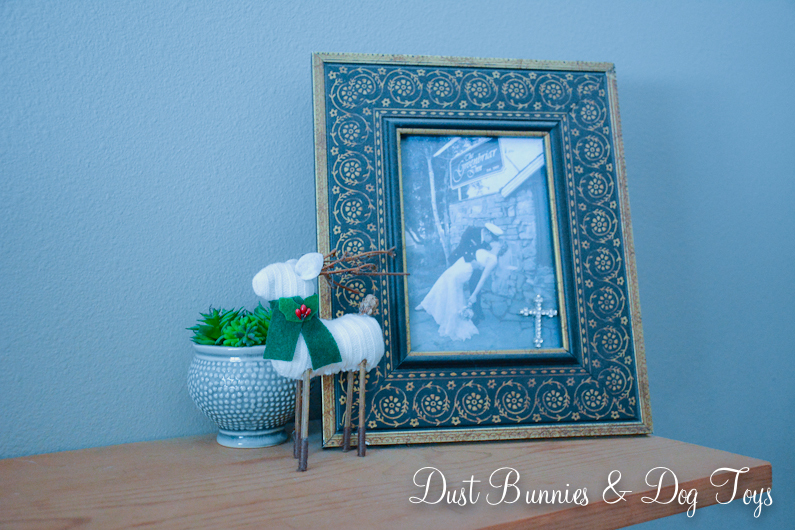 Over in the dining room, Moe found a new home this season on the scroll wall hanging where we put up the holiday cards we receive. I really enjoy seeing him more often this year and think this will be his ‘usual’ spot going forward. Next to Moe, this new addition came to us from WA where my wonderful Mother-In-Law went on a mission to find him at an antique shop I follow online. Several ‘elves’ have made an appearance around our home this year and I think they are great care-takers for our herd. I haven’t named him just yet, so if you have suggestions I’m all ears. He reminds me of the Nordic elves we saw depicted in Iceland and even the Scottish Highlands so maybe I’ll do a theme using either of those cultures. My dear, Milo ended up in the other windowsill, where he’s safe from the dogs. I’d be pretty heartbroken if something ever happened to him. His expression seems to say he knows how dangerous being closer to the floor could be in this house! 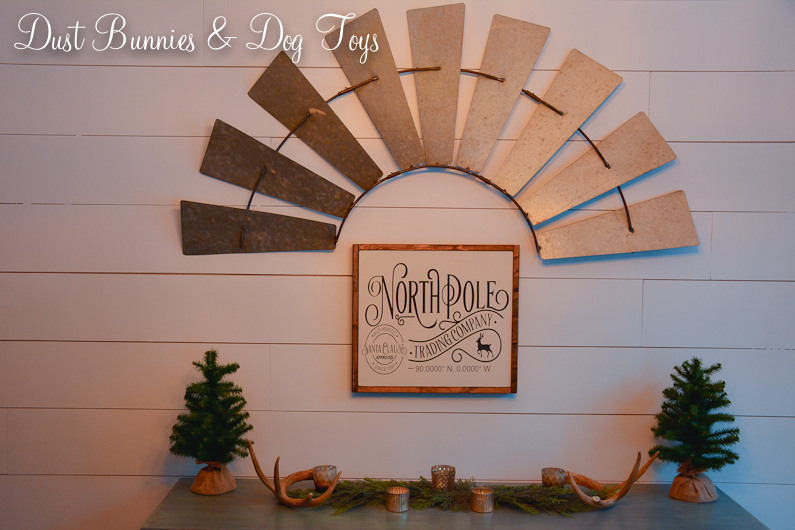 On the back wall of the dining room I hung my North Pole sign from last year under the windmill and decorated the top of the buffet with faux winter greens, antlers and gold tone votives. I’d like to make some twig luminary trees to add to this set-up and since the look is “winter” rather than Christmas I’ve got time to do that even after the holiday. The two votives in the front are new this year. They were a fun little find at the Alaska Chicks Vintage Market a few weeks ago. At just $2 each I thought they were a great price too! 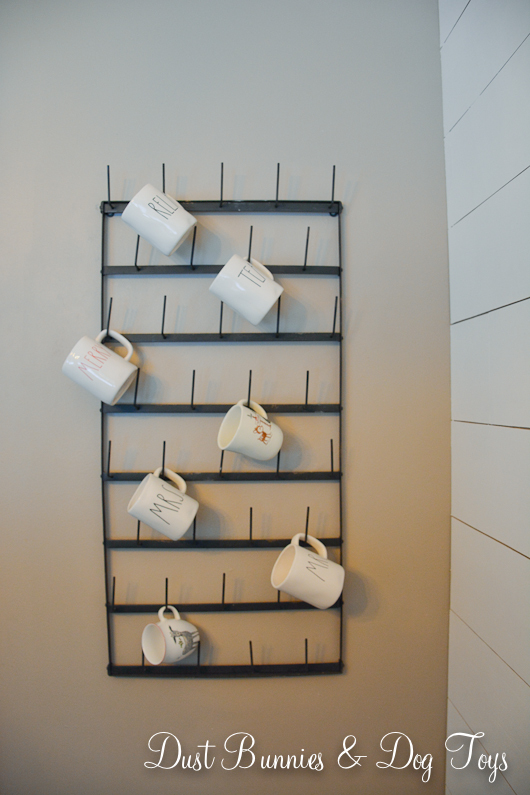 The new mug rack also has a few more additions to it for the holidays after the Alaska Chicks show. 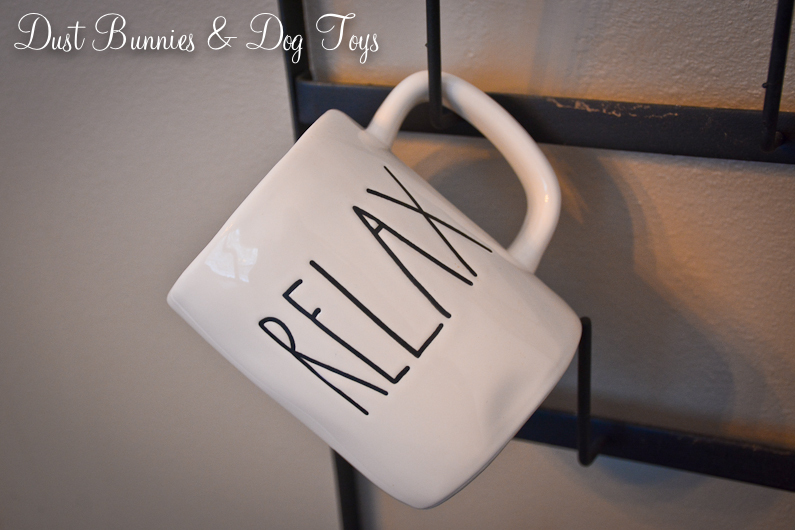 This “Merry” Rea Dunn mug was one of my favorite finds that day thanks to one of my favorite vendors, Rustique Designs. 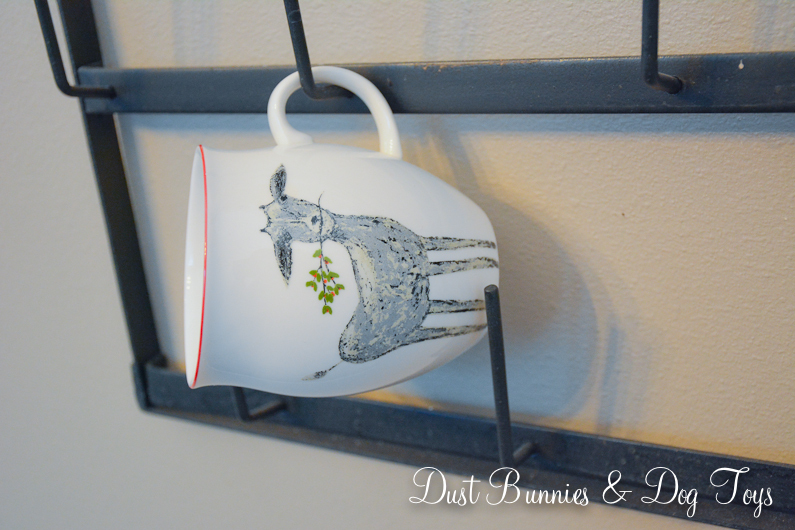 She’s who I got the other Rea Dunn mugs from and who made the reindeer sign and nativity sign! 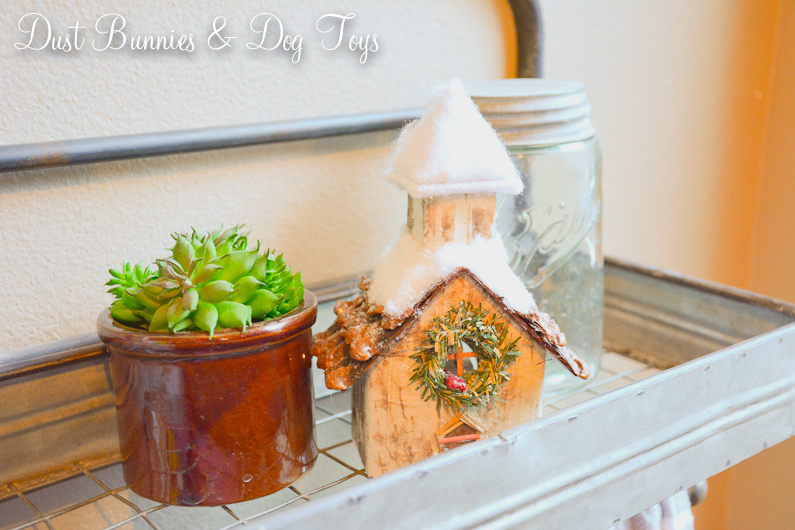 There are also little touches of Christmas in the other rooms, including this little church in the laundry room. 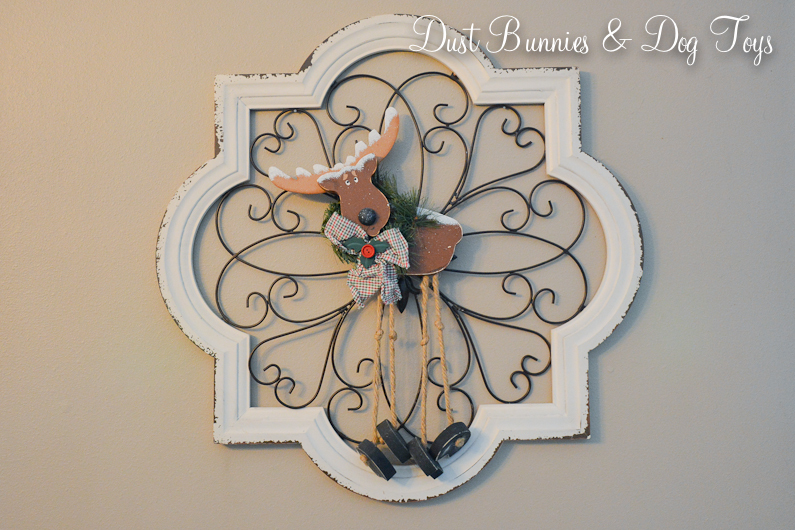 It started out as an ornament, but I like it much better as a decor piece here after a few little modifications. 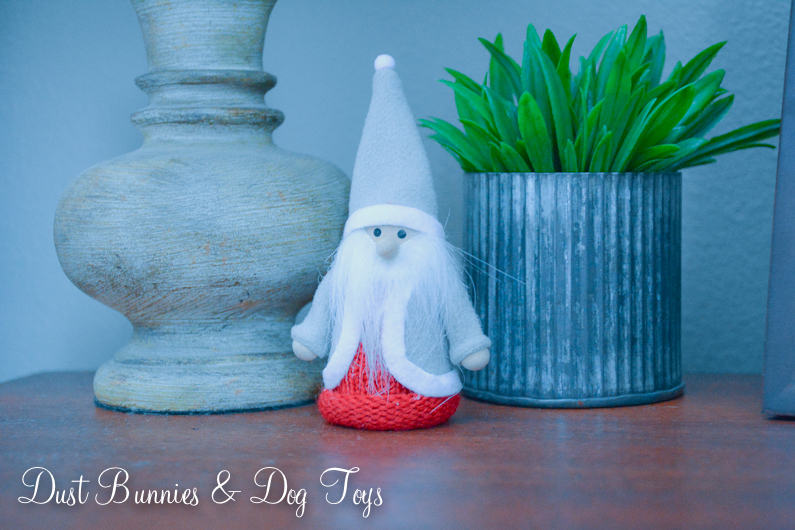 Below the shelf is another little elf with a reindeer buddy just his size to keep him company. 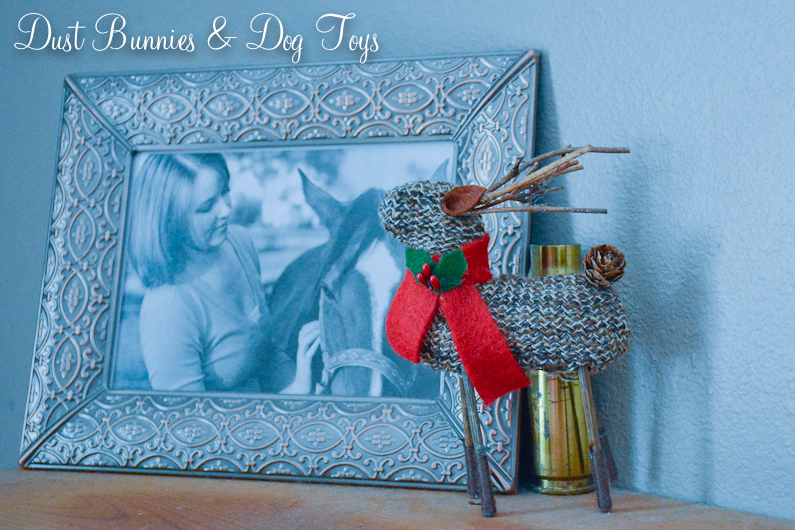 These two also started life as ornaments – I think I’m sensing a trend here. The office window where Max used to sit is now home to the lovely Daphne who joined the herd last year. 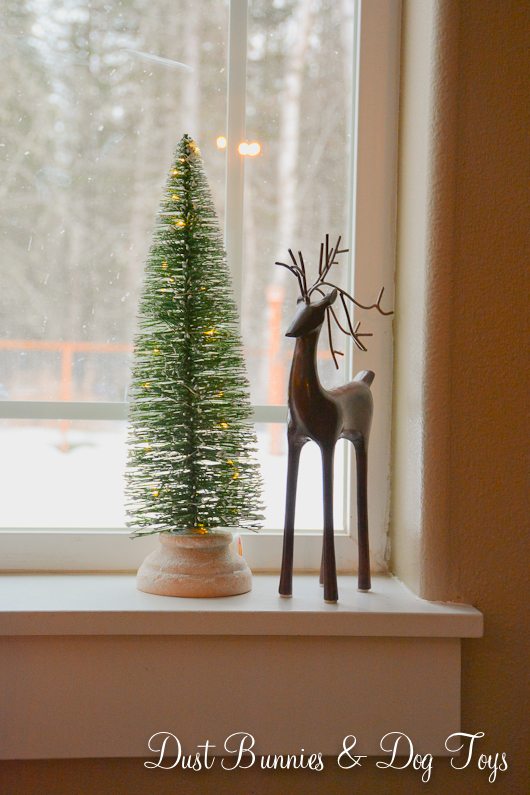 She’s got her own little tree and some pretty votives to light up the dark. Also in the office is this sweet little fox I found at the grocery store! He was the last in the display and just begged to come home with me. He’s looking quite dapper on the daybed, among all the pretty pillows. He also needs a name so keep those suggestions coming! 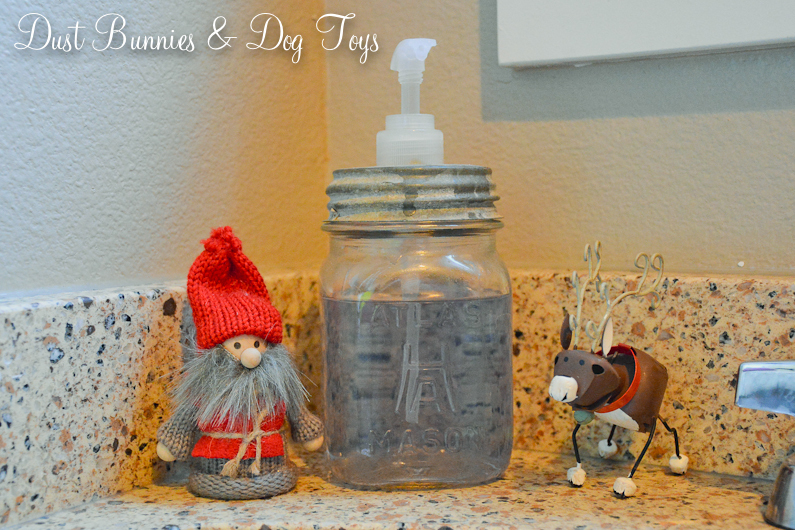 In the hall bathroom another couple of ornaments turned decor add a little touch of the season to the existing decor. 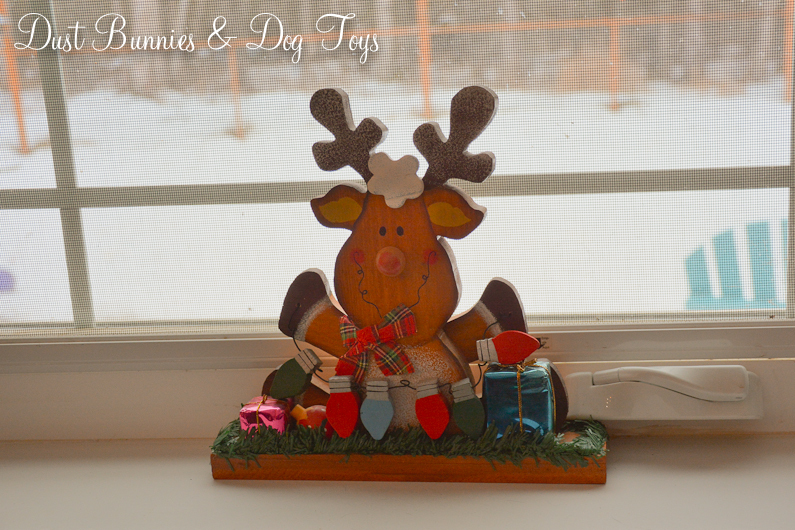 In our bedroom are two pretty little reindeer my sister found for me last year. 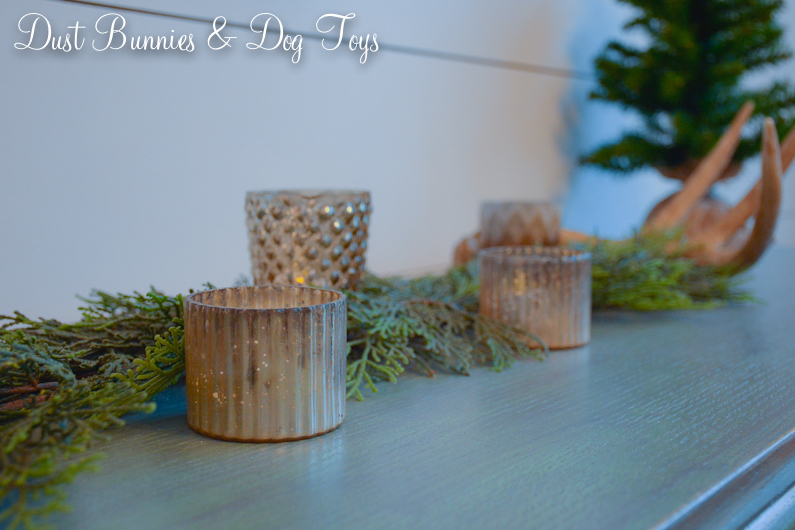 They too started as ornaments, but now they hold their own on our nightstands so we have some holiday cheer at the end and beginning of each day. 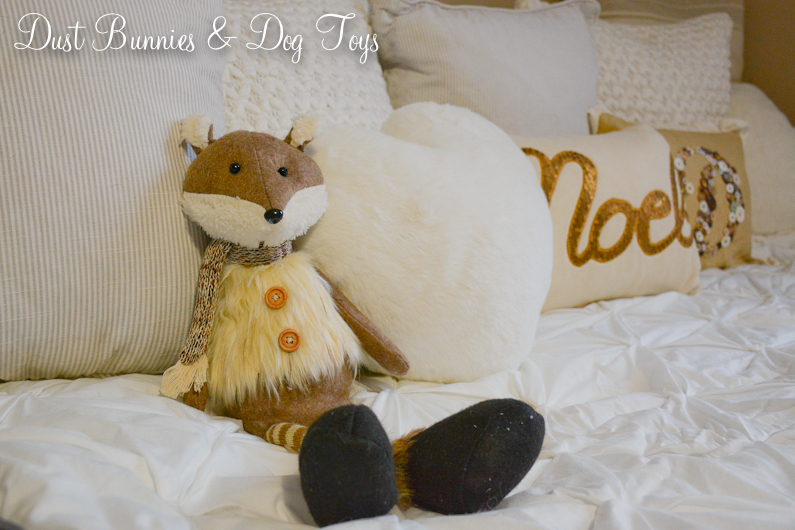 In the guest room, there are some little Santas on the nightstands. If you follow me on Instagram, these are the find I made at that lovely store I made it out of only spending $10! 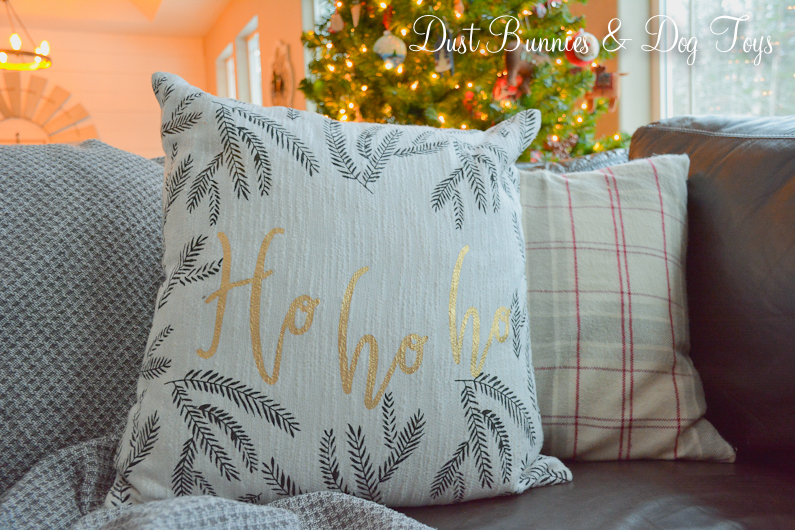 The chair in the guest room also got a little update for the season with this simple pillow I found at Hobby Lobby during our recent trip down south. I’m so glad they already had Christmas stuff out while I was there! Hey there everyone! I know it’s been quiet around here since our trip. Life has been super busy and I’ve barely had time to work on projects let alone share any. But today I’ve got a little change in the dining room to share. 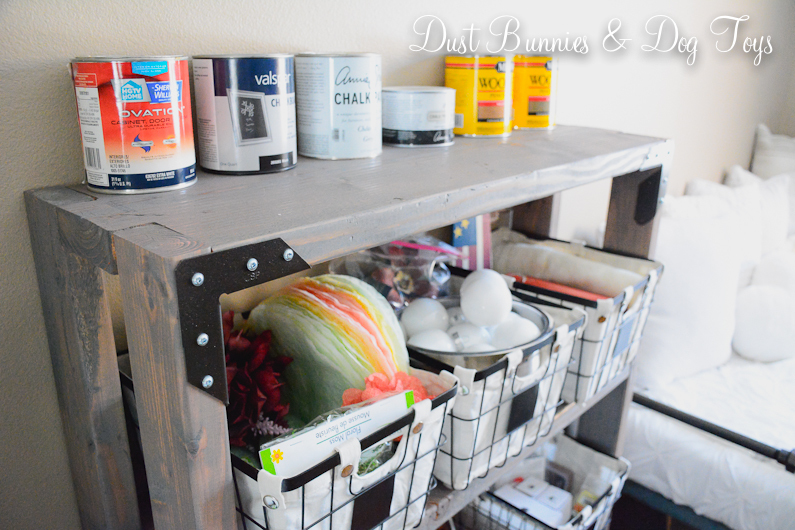 We replaced the indoor herb wall that wasn’t growing to well with this simple farmhouse style rack. 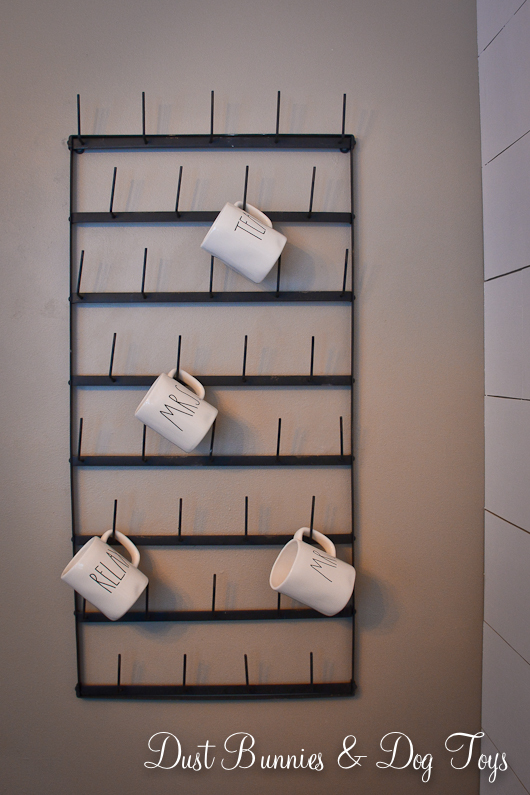 It’s a perfect fit for the short wall just off the laundry room and has become the spot to display my budding collection of Rea Dunn mugs! This was one of several larger items we hauled back to Alaska on our recent trip. I’d ordered it some time ago and had to ship it to my sister’s house in VA so I could pick it up when we were there for my nephew’s wedding. 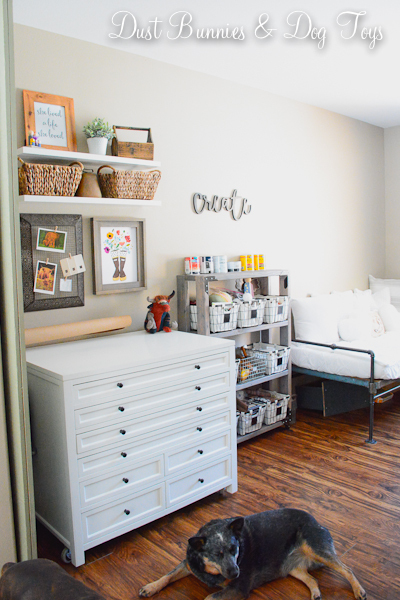 Here’s a wide shot to give you an idea of where it’s located, along with a sneak peek of the minimal fall decorating I did. 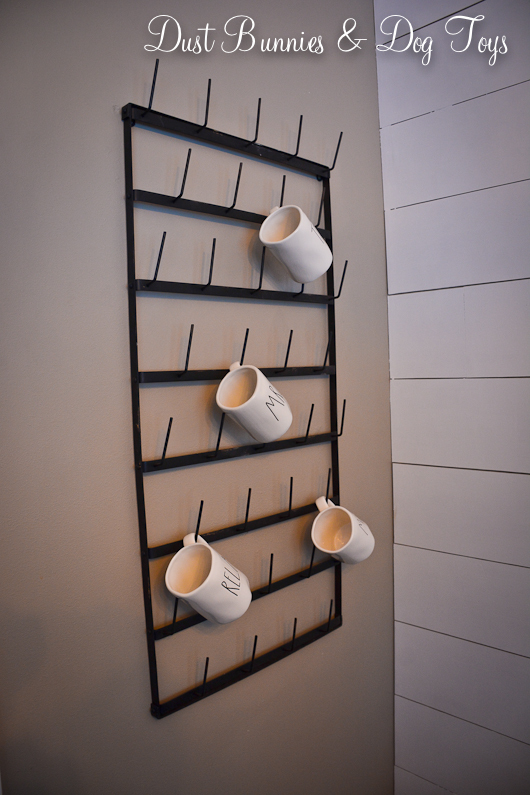 I love the contrast of the black distressed metal and white mugs against the tan wall. I wish the mugs could face out to the left so they were readable from the main area, but overall it’s just what I envisioned. 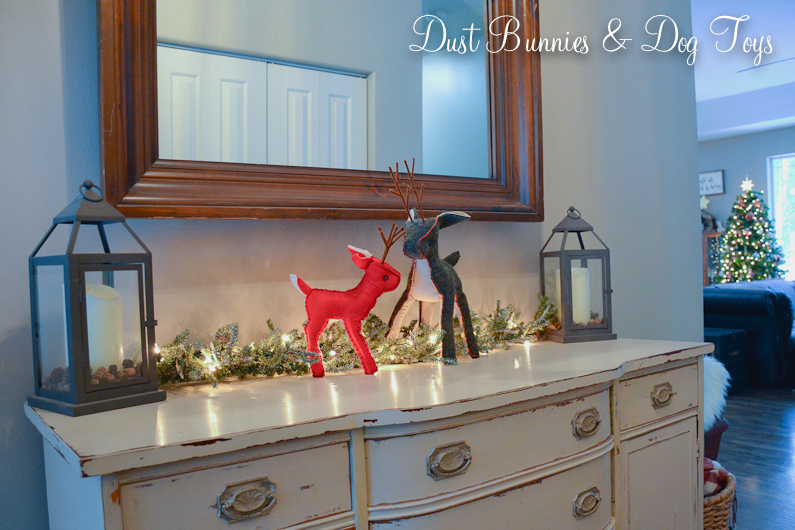 I plan to add a little bunting or garland during holidays to add a bit of flair, which might be my next DIY project. My collection is still pretty small with only four options. The MRS. one is my fave at the moment and the Relax is a close second. 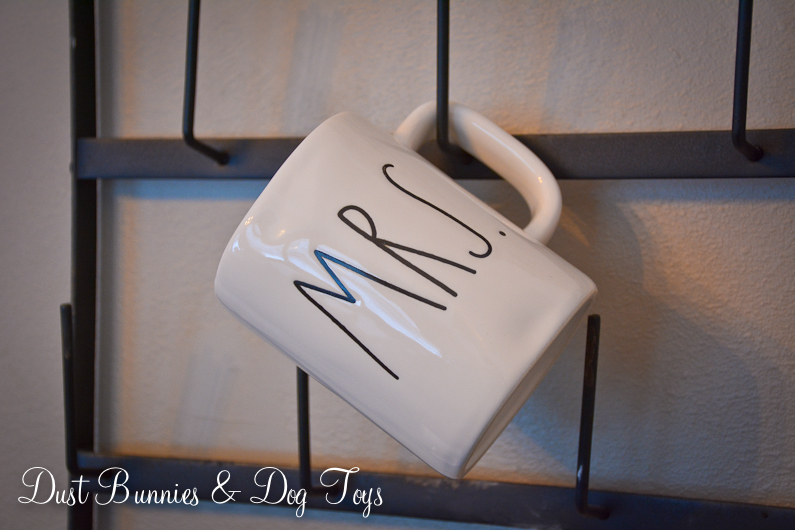 The Hubs has enjoyed using the MR. a couple times already so I guess he thinks this is a good update, even if it did require patching the holes from the herb rack and repainting a section of the wall. Good thing he loves me right?! 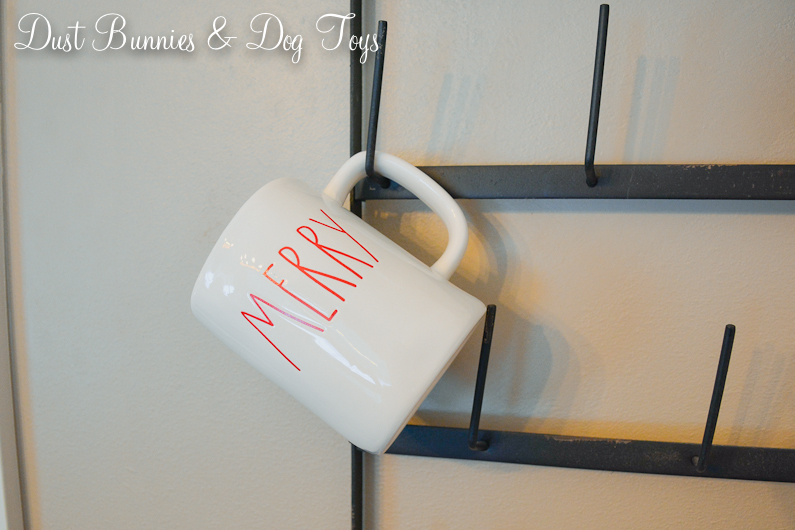 I’ve added a few more mugs to my collection recently that feature holiday designs so don’t be surprised if those show up on my social media feeds! 😉 I’ll be back in a day or two with another little project I did this fall, so stay tuned. 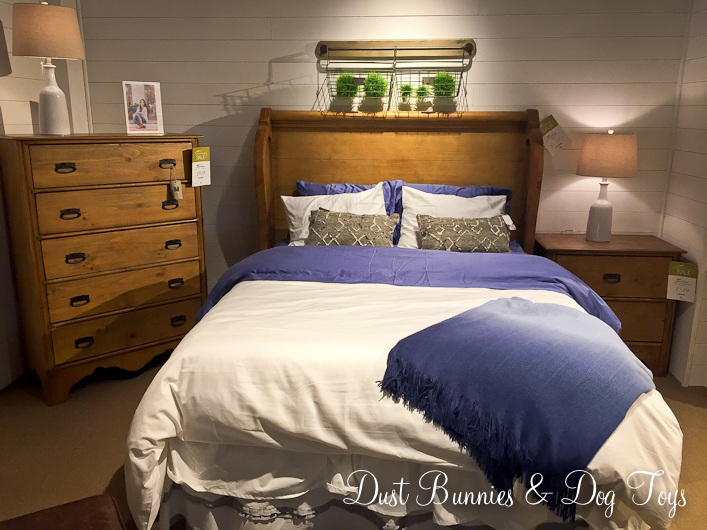 Checking Out Magnolia Home Locally! 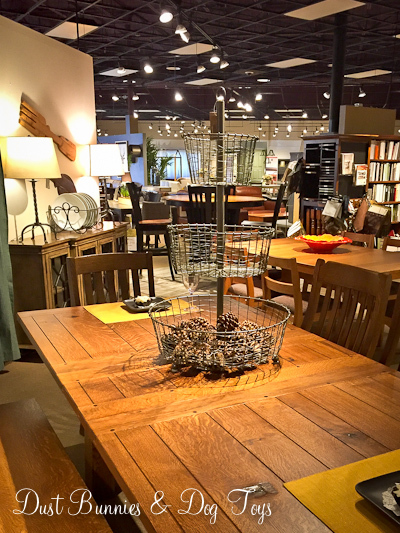 I recently learned that Joanna Gaines’ furniture line was available through a local furniture retailer who usually specializes in quality Amish furniture called Treeforms Furniture Gallery. 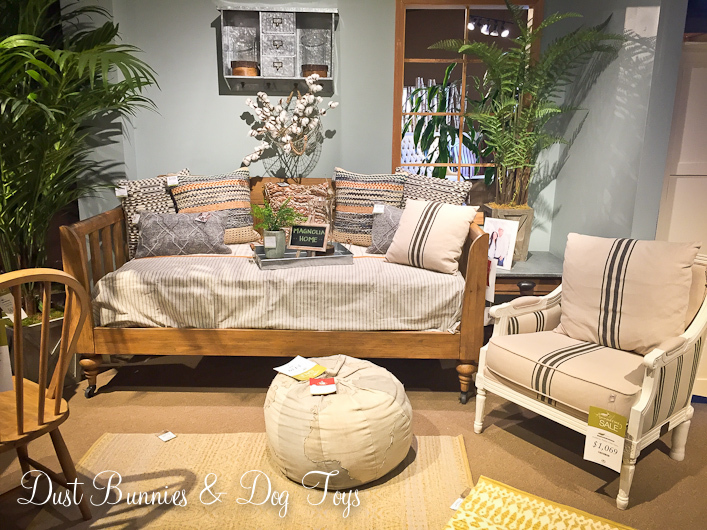 I stopped by their showroom to check out what they had during my lunch break the other day and had to share the great ways they styled the pieces. We’re not really in need of any new furniture so this was just a browsing trip anyway but it was fun to see the Fixer Upper style in person. 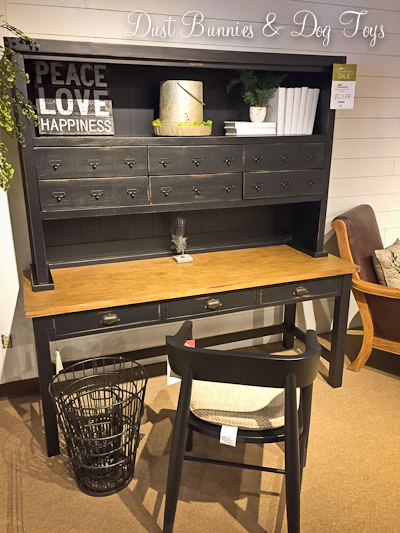 Including a few pieces from recent reveals, like this school desk and framed bed. 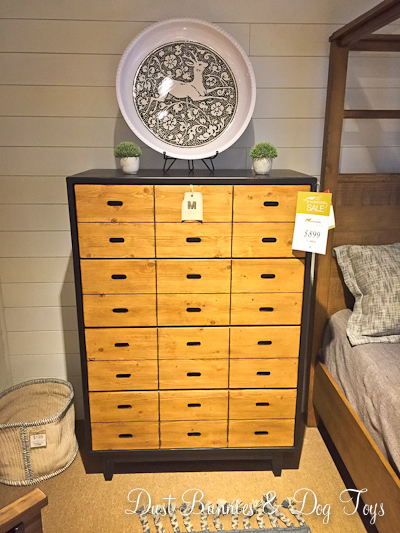 I really liked the combination of modern and rustic in this tall dresser, which looked like multiple small drawers but was really 4 large drawers. 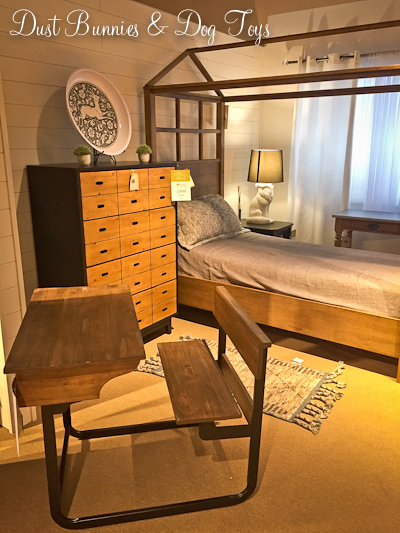 The Magnolia line was just a portion of their showroom so I browsed a few of the other areas too. 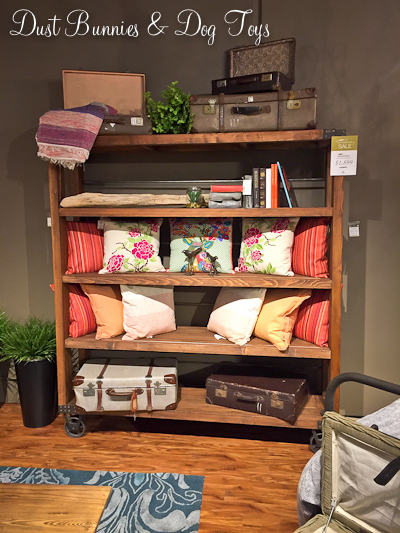 I loved this rustic bookcase, which was no surprise since I’ve had pinned for sometime now. 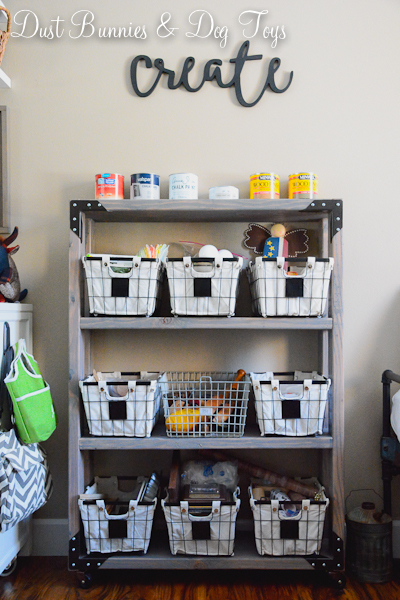 I’m pretty sure I’ll be replacing the ladder shelf next to the craft cabinet with something like this in the near-ish future, albeit with a much less expensive and custom sized DIY version! 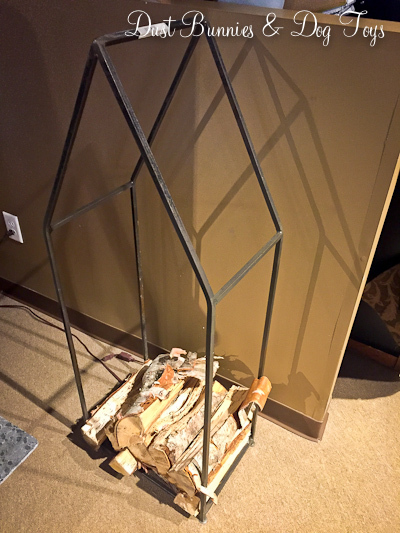 I also really liked this metal firewood rack. It too was fairly pricey and I think it’s a bit tall for use at our fire pit, which is the only place we burn wood thanks to a gas fireplace indoors. 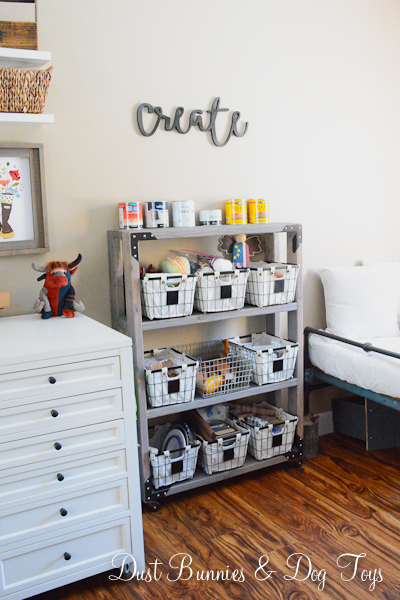 I’m thinking I might recreate something similar with PVC pipe painted to look like metal or copper and place it on cinder blocks so it’s raised off the ground. 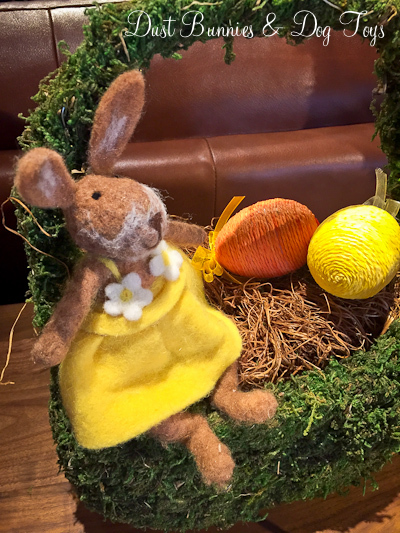 They had some really adorable Easter accessories out. 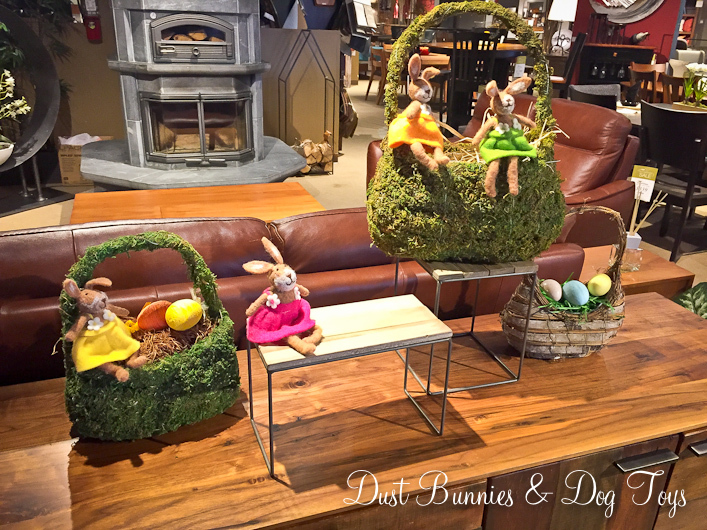 I considered getting a few of the little bunnies for my spring decorations but there were no price tags which meant they were also just showroom accessories. It’s a shame because I think they could really have some good additional income if they had a small inventory of the accessories! Especially ones this cute! 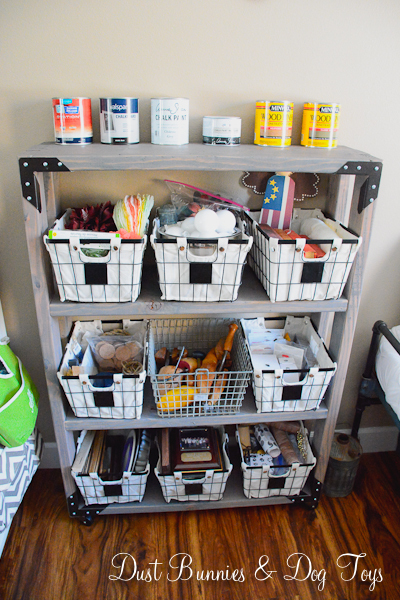 One accessory that was for sale was this large metal tiered basket. 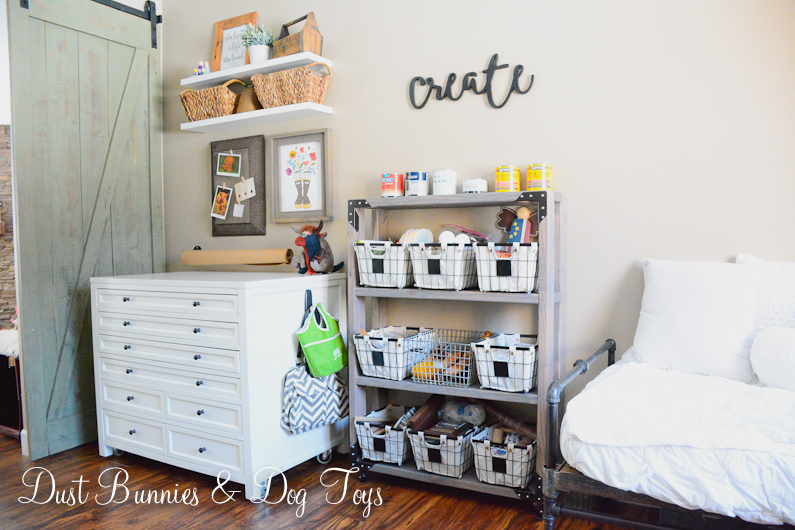 I’ve had similar pieces and always used them for organizing or decorating up high so seeing it as a centerpiece was definitely a new idea. It might be something fun to try as the holidays approach later this year. 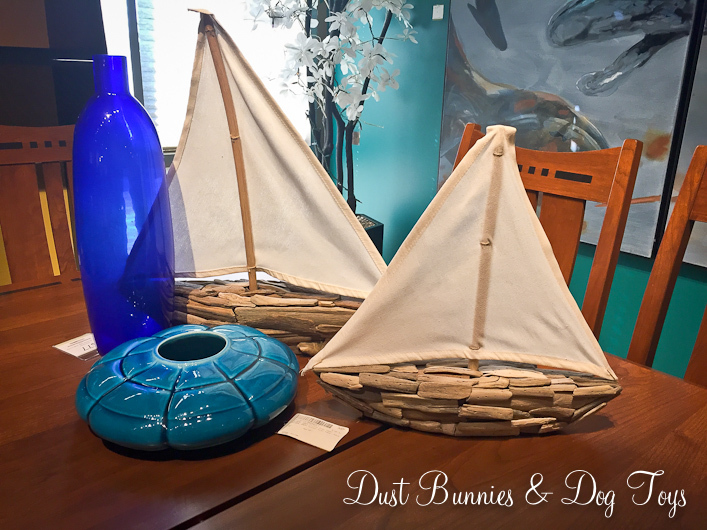 The driftwood boats also caught my eye. I’ve got a whole board of driftwood ideas pinned for one day when I have extra time to make something out of my stash of driftwood collected when we go riding in the summer. 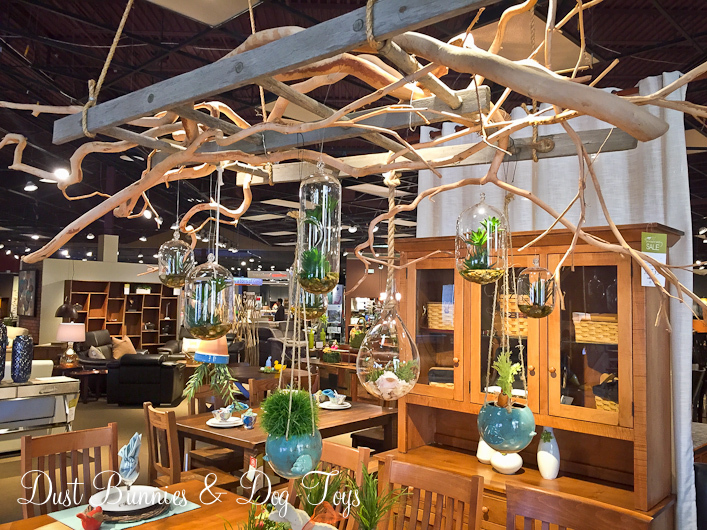 My favorite display item was this unique hanging terrarium chandelier. 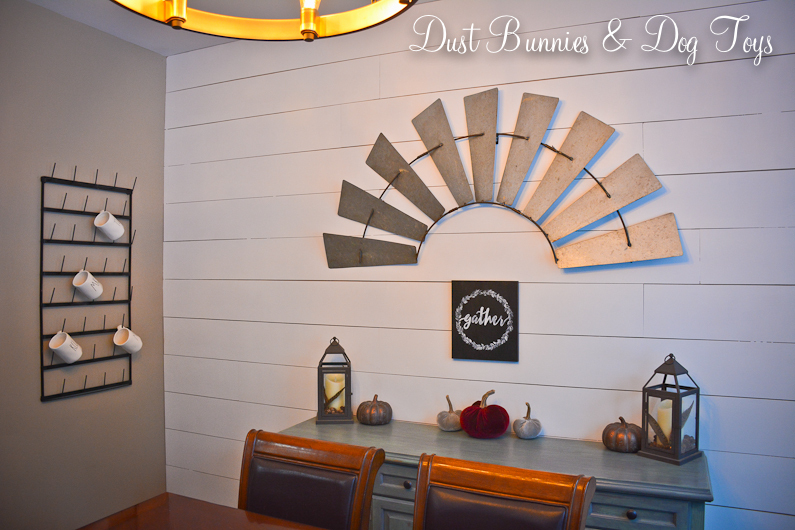 It was the perfect balance of rustic and modern. Several of the hanging pieces here were for sale, but I’m usually not great with small pots as they require daily attention rather than the weekly watering my plants usually get. Happy New Year everyone! I hope your holiday weekend was exactly how you wanted it to be, wether that was exciting or relaxed. We took the relaxed approach. I stayed home and the Hubs went hunting so no big ball dropping parties here. Today I wanted to share another piece of wall art that came back on our recent trip to Portland. This metal reproduction windmill. 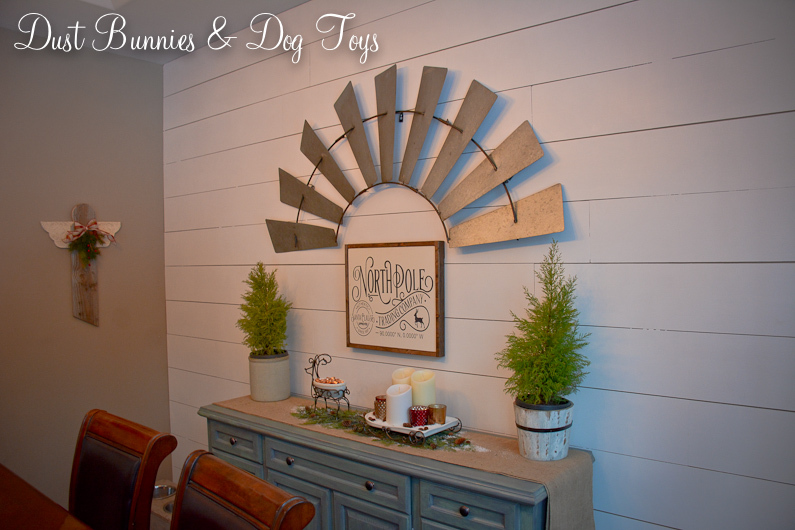 If you remember I purchased an authentic windmill from Alaska Picker about a year ago and planned to display it on this faux shiplap wall but it was SUPER heavy and the Hubs just wasn’t sure we’d be able to locate studs in the right spots to mount it securely. 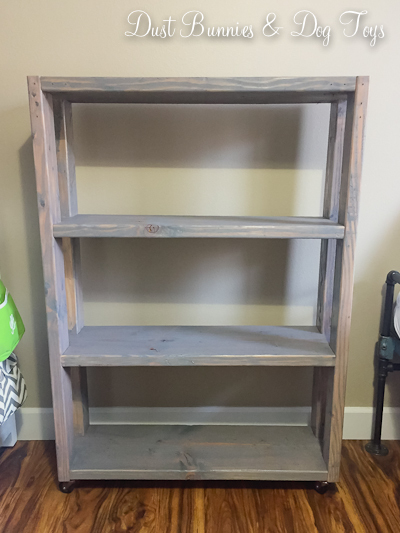 So when I spotted this baby on DecorSteals.com for $90 a few weeks before our trip I snapped one up and had it sent to my Mother-In-Law’s house since they wouldn’t ship to Alaska. This one is smaller and much lighter than the authentic one we bought. Plus it comes apart into three sections so should I ever want to change things up I can use them separately without much effort. 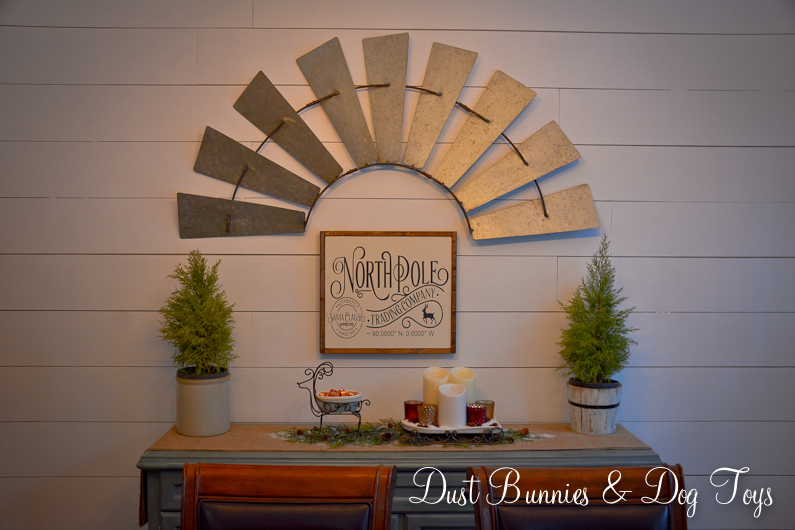 It looked so awesome with our holiday decor and my new farmhouse style sign fit perfectly inside the bottom curve. 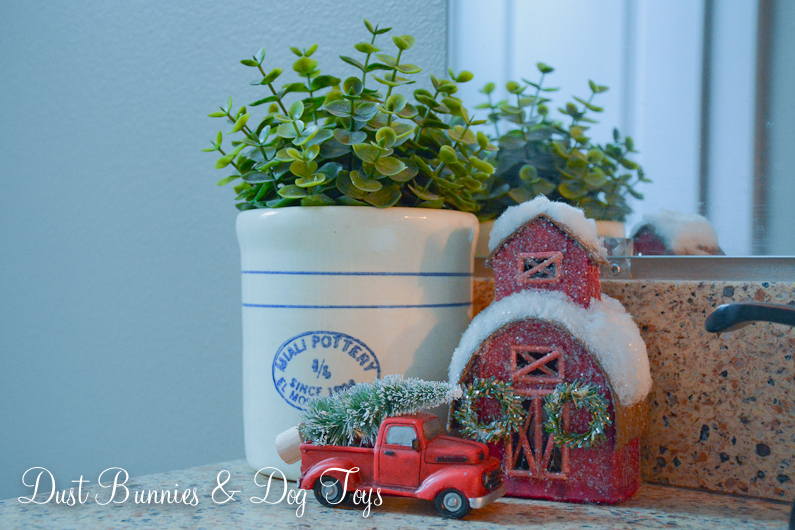 I packed up all the Christmas decorations over the weekend and I’m still working on my ‘winter’ decor for January – March, so we’ll see how I decorate around this in the coming days. I’m considering adding two hanging lanterns or sconces on either side since the wall is so large, but I’ve got something else from our Portland trip going up on the wall where the barn wood angel hung for Christmas, so I want to wait until I get that up before I make a final decision, in case it would make the space too cluttered. So you’re probably wondering what we’ll do with the large and expensive authentic windmill right? Don’t worry it will still get it’s due – I found a local buyer for it who wants to display it on a wall in her home. And since she’s buying it for what we paid, we’re breaking even on that attempt. Hopefully, she’s able to figure out a way to secure it well and enjoys it as much as I do this one.